Earlier this year GSMA committed to support the Global Goals. The partnership between the UK government, the GSMA Foundation, and the GSMA (which represents mobile operators worldwide) is essentially the global mobile industry pledging to take a dedicated part in providing life-enhancing services to millions of people in poverty. This is a poverty-busting milestone. The UK’s Department for International Development (DFID) will provide financial support to the partnership to support development and dissemination of new technologies that will improve response to natural disasters, help women obtain financial services and boost access to safe water and clean energy across the developing world. This is a seminal moment in the mission to succeed in securing the #GlobalGoals by 2030. Read on for the reasons why. Mobile technology can help break this silence. By providing those in disaster hot-spots with the means to communicate their situations in real-time, response teams are given immediate information from the front-line. But mobile technology is not only useful in an emergency. There are many ways that it can support the mission to end global poverty, addressing each and every one of the Global Goals, on a day-to-day basis. A fundamental one for ONE is its role in the data revolution. As our Poverty is Sexist report points out quite clearly – we cannot help women or monitor developments and efforts to empower them if they are denied a voice. Giving them the means to be heard and accounted for allows supportive activities to be monitored and tailored so that results are forthcoming and development aid is spent wisely. This is vital if we want to achieve Global Goal # 5 – Gender Equality in the allotted 15 years. Proof of identity is an essential prerequisite for gaining access to basic services, including enrolling in education, health care services, or even claiming rights to inheritance or obtaining legal protection in courts of law. Yet in some countries, as few as 21% of children are registered at birth, often due to poor communications infrastructure between rural villages and national birth registration offices. In Uganda, Mobile Vital Records System (VRS) is enabling village registration agents to send birth registration details of newborns via mobile phones through to local hospitals connected to a 3G web-based application. This enables both mother and child access to support, education and health-care services. Launched in 2010, 3-2-1 is a free, on-demand voice and text-based information service that has attracted over 3 million subscribers. It has provided the first ever on-demand mobile gender information service for both men and women in Madagascar, where gender-based violence is a significant issue. It has helped facilitate first-time SIM ownership for women, and 93.1% of users reported an increase in decision-making within their household as a result of accessing 3-2-1’s educational information on human rights and gender equality. 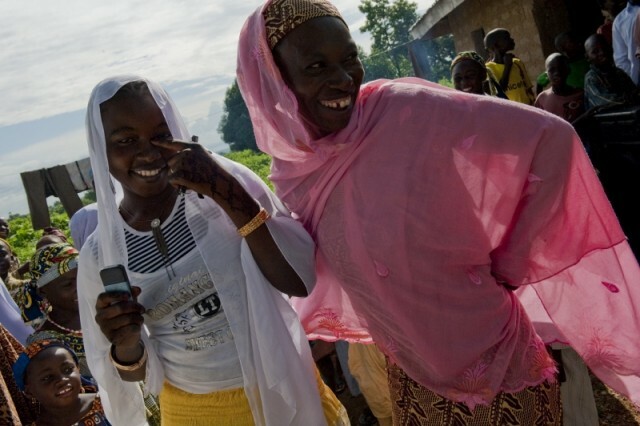 GSMA have committed to addressing and reducing the mobile gender gap by launching the Connected Women Collective Initiative, which aims to provide women with improved access to mobile money and mobile internet. GSMA have also identified ways of addressing mobile savings and insurance support for women and mobile maternal health services in the developing world. And this is just evidence for Global Goal 5! In fact, GSMA have provided examples of ways the mobile industry can help support each one of the Global Goals. If like GSMA and ONE you support Global Goal 5 – the quest for worldwide gender equality, sign our Poverty is Sexist petition TODAY.